We’ve been a paying customer of MDDHosting for 40+ months. During that time, we’ve monitored their performance. MDD is a boutique (read: small), private hosting company founded fairly recently in 2007. Speed and service. The ‘meat and potatoes’ of web hosting. Their straightforward, no-BS approach seems refreshingly honest in an industry that can be – well – less so. We’re always on the lookout for the diamond in the rough; new hosting companies that offer a different or better approach than the old industry stalwarts. MDD looks like a perfect candidate. We purchased MDDHosting’s ‘Basic Plan’ in June 2015, and set-up a basic WordPress website to begin running tests for the eventual unbiased review you’re reading now. You can find all of our detailed performance stats, like uptime and speed, by clicking ‘History’ for more. 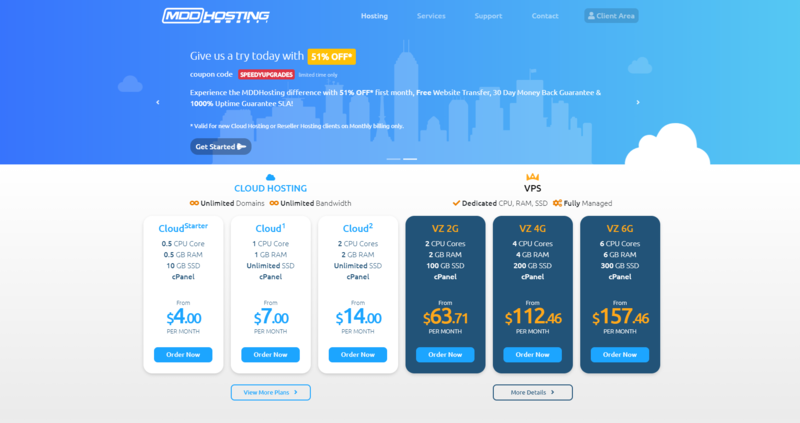 Most hosting companies sell the same service (more or less). Some throw in a few extras, but the big three of uptime, speed, and service support are primarily what you’re buying. If a web hosting company fall short in any one of these areas, there’s an issue. Two or more – run! Fortunately, MDD passes two of the three with flying colors. First up – speed. This is where MDD have been pretty good the last 10 months. During the last 10-months, they put up an incredible page load time of 393ms, which is 77% faster than the industry average page speed of 890ms. A quick background check with other sources confirmed that speed is one of the biggest reasons for so many happy MDD customers. MDD provides standard 24/7/365 customer support through phone, email, and ticketing system. No live chat for now. During our review processes, they responded to our tickets within less than three minutes (which is fast enough to be considered as slow live chat I guess). Once again MDD performs well in one of the ‘big three’, providing quick, efficient support that’s good enough for an 8/10 at the very least. That was a bad technical joke, that stands for what you see is what you get with MDD. No hidden fees. No pricing tricks where you have to sign away the next 35 years of your life for the low advertised website price. And no games with limiting standard features to force you to accept the more expensive plans. Sure, there is some space and storage limitation for lesser plans. Otherwise, you get all of the same features that the more expensive ones offer. You want to pay for just a single month, as opposed to a full year (or more)? Sure, you can go ahead and do that. The annual discount isn’t that big either, therefore you’re not missing out on much. MDDhosting will happily help you relocate your site for free if you’re moving from another host. No fees or tricks. MDDHosting offers an unconditional, hassle-free 30-day money back guarantee with most of their plans. Nothing special like 90 or even 97 days, but not bad either. Everything good comes at a price. With MDDhosting, one of their ‘cons’ is just that. Over a ten-month period, we tracked MDDHosting’s uptime for our site to make sure things ran smoothly (and that there weren’t any hiccups). Industry standard comes out to around 99.94% uptime, and MDD 10-month overall was pretty bad. It’s a bit of a mixed bag, most months they have a really good uptime, but this year September has really let them down. Coming in at 99.82% over the 10-month testing period, which is not good. Cloud starter plan: This plan costs $4.00 per month. It comes with 10 GB of disc space, unlimited domains, unlimited bandwidth, unlimited databases and email accounts. 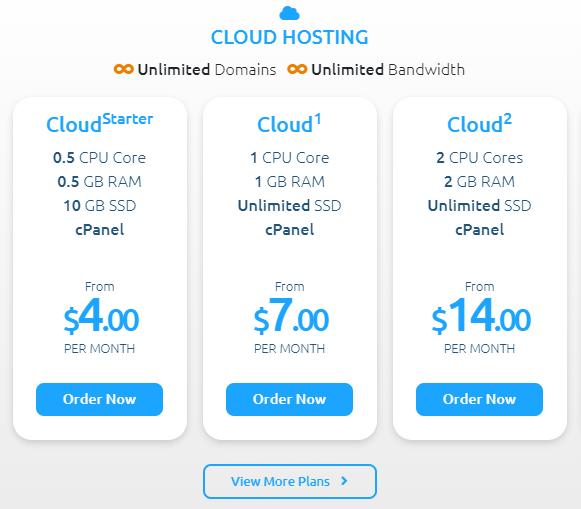 Cloud1 plan: With $7.00 per month you get unlimited disk space, domains, data transfer, databases and more. Cloud2 plan: $14.00 per month. Comes with unlimited disc space, unlimited domains, unlimited bandwidth, unlimited databases and email accounts. Ease of Signup: Very lengthy signup process. Hidden Fees and Clauses: By signing up you agree that they have the right to change the monthly payment amount and other charges at any time. You must not use more than 25 percent of system resources for longer than 120 seconds or you risk account termination (kinda standard among the industry). Abusing their staff in any medium or format will result in termination of your account without refund (which is also kinda respectable). Installation of Apps and CMSs (WordPress, Joomla, etc. ): Quick and easy install of popular apps and CMSs with Softaculous. MDD is relatively new to the hosting game. So far, they’ve put up questionable uptime numbers, fast page loading times, and great customer support. Their no-BS approach is also a breath of fresh air. Yes, we kinda recommend them (but there are better options out there). Even tho they have come down with their price, there are still many less expensive options out there if you’re just looking for a simple hobby or personal site. Otherwise, despite being one of the most expensive shared hosting options available, you’ll probably get your money’s worth if you take advantage of all the ‘unlimited’ options that even their Basic, limited plan comes fully loaded with. P.S. If you want to see hosting providers that ranked above MDDHosting, check our web hosting comparison here. I have been with with MDD for a couple of years. Help service is not just very fast, but inevitably polite and knowledgeable. I have never had to go beyond first level of service to get the help I need. Speed is awesome. 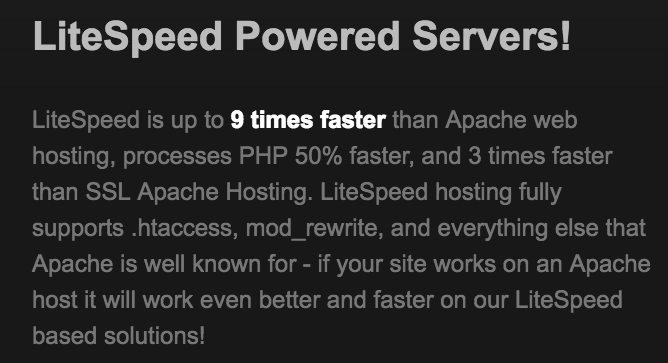 LiteSpeed server is fast on it's own but MDD makes server-side caching available for free to all users - it blows other caching systems away. Uptime is usually good, not great. September was a nightmare with all shared and reseller sites down for three to five days after the entire data center was destroyed by a typo (yes, a typo!). But even before September uptime was less than elite. If Michael and his team can solve that one glitch - and I think they will with lessons learned from the September debacle - MDD will be as good as it gets for relatively low-cost shared and reseller hosting. They are already my favorite of the eight hosts I have tried over the years. I have 2 websites pointing to MDDhosting (for the last few years). Please note: These sites are NOT major business things. They are casual sites. (so if they go down, I am not anxious). I am disappointed though that they do not load often. Every time I message MDDhosting support, they either say its my cache that needs re-loading, or that i have been blocked because of their ‘brute force protection’. But I dont get any warning that I was blocked. I have to find out for myself a few weeks later when I bother checking my sites. I never have to refresh my cache on any other websites around the web that I re-visit, so why do I need to refresh it constantly with MDD hosting? Also: I find that the website loads slowly. Their customer support replies fast. The first year was cheap, but subsequent years are expensive. I am not saying they are terrible. I just think they are AVERAGE. Maybe the people giving great reviews have Premium Hosting plans (and not the entry-level plans). But either way, they site should always load and keep on getting blocked or other problems. I’m currently searching for a new host to point my domains to because i think their fees are excessive (for an average service). What's up with the constant price changes? I hate MDDHosting for changing prices all the time. Last week they cost $4.99/month, yesterday they were $2.99 and today they are $3.80 – what’s up with that? MDD Hosting is our last bus stop. We have used so many popular hosting companies that promised so much but delivered very little. Our last experience with a EIG-owned hosting company prompted us to narrow down our search to MDD hosting and Squidix. We went for the shared server for one of our websites (low traffic) and premium for our primary website. Honestly, we can’t different the performance of the shared server from the semi-dedicated server because both of them are simply awesome. We receive almost instant (about 3 minutes) email support each time we submit a ticket and haven’t noticed a single down-time yet. The pricing is a bit on the high side bit its really a value for the money. We can easily recommend these guys to anyone in search of a rock-solid hosting company with really solid infrastructure. I’ve been hosting with MDDHosting shared hosting since October 2014, and I can describe my experience in one word: flawless; aside from some minor hiccups – a very short outage due to hardware upgrade and the usual scheduled maintenances – my blog on MDDHosting has always been up, fast and I’ve never had a single reason to contact support…because I haven’t had a single issue. I definitely recommend MDDHosting hands down; while the prices may be a little more expensive than other shared hosts, the extremely high quality of the service is worth every single penny you spend. How does ‘MDDHosting” rank vs. competitors?